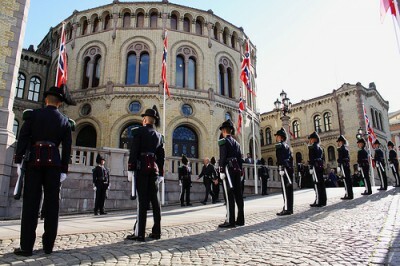 Flags were flying, politicians were unusually dressed-up and customary royal pomp reigned inside and out as the 16oth session of the Norwegian Parliament formally opened on Friday. The gloves will soon come off, though, as debate starts flying over issues like the refugee crisis, tax reform and the government’s proposed state budget for next year. As King Harald read at least most of the government’s proclamation for the coming year from the throne, with all government ministers standing at attention, the stage was set for new political conflicts. Prime Minister Erna Solberg’s conservative coalition is halfway through its elected term, with just two years left to produce results to help it win reelection in 2017. 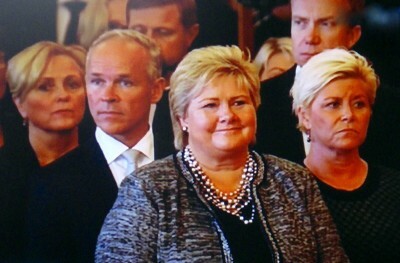 Solberg, just back from the opening of the UN’s General Assembly in New York, faces a long list of challenges ahead. Biggest among them is the ongoing refugee crisis, which topped her government’s proclamation on opening day. She and several of her ministers face criticism for being unprepared to meet the thousands of refugees streaming into Norway, mostly from Syria, and for failing to accommodate them all. The government is now scrambling to deal with the situation, and promised to take its share of the refugee burden within Europe. Next on the agenda is the economic downturn in Norway sparked by last year’s sudden plunge in oil prices. Unemployment has been creeping upwards since, and Solberg’s government will be under pressure to create new jobs, revive the economy and continue the so-called omstilling (restructuring and diversification) as Norway lessens its reliance on oil. The acid test will come when Solberg’s finance minister, Siv Jensen of the Progress Party, presents her second state budget on Wednesday. “It will be very exciting to see what short- and long-term proposals it will contain to address unemployment, and whether its social profile will again be an area of discussion,” Hans Olav Syversen of the Christian Democrats, who heads the parliament’s finance committee, told newspaper Aftenposten. “I hope we’ll avoid a reprise of last year’s debate.” The Christian Democrats are one of the government’s two support parties, but have sharply disagreed on several issues including tax reform. That’s high on the government’s agenda, though, with plans for following up a tax reform commission’s proposal due the same day as the budget is unveiled. Newspaper VG obtained a budget leak this week that the government will once again cut Norway’s controversial tax on net worth (formueskatt). Opponents claim that favours the wealthy at the expense of Norwegians with lower incomes. The politicians also continue to argue over whether stores should be allowed to open for business on Sunday. That issue was not resolved during the last session and opponents contend a vast majority of Norwegians don’t want to open up for shopping on Sundays. The government wants to liberalize the law, and at least give shopowners the option of opening if they like. The most difficult issue, however, will likely be housing refugees and deciding on how many more Norway can accept. An estimated 20,000 are expected to arrive this year, while more than 5,000 others already have won asylum but continue to await settlement in local townships. Environmental issues leading up to the UN climate summit in Paris in December and restructuring the military will also dominate debate in Parliament. As usual the opposition will be ready to challenge the government’s priorities.